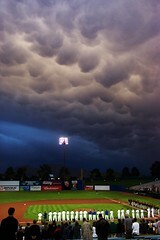 What Do Baseball and Severe Weather Have in Common? What do baseball and severe weather have in common? Okay, I know what you’re thinking, but the commonality is not that they both occur in spring. But bear with me and I’ll clarify. Severe weather can be a lot like the aforementioned baseball game. Up to this point we’ve had a quiet spring– no real severe weather threats to speak of. And just like those outfielders, we might be tempted to let our guard down— to follow our normal weekend routines and to shelve our severe weather plans. This weekend, many experts predict that severe weather could indeed impact parts of the southeast. The state of Georgia is in a slight risk area for strong winds, hail and, yes, isolated tornadoes. Now is the time for you and your loved ones to review your severe weather plan to make sure that you are prepared for severe weather threats.